Sidney Slon/Pipe Dream Photographer Freshman guard Sam Sessoms registered 15 points and contributed five assists in a blowout loss against Stony Brook. 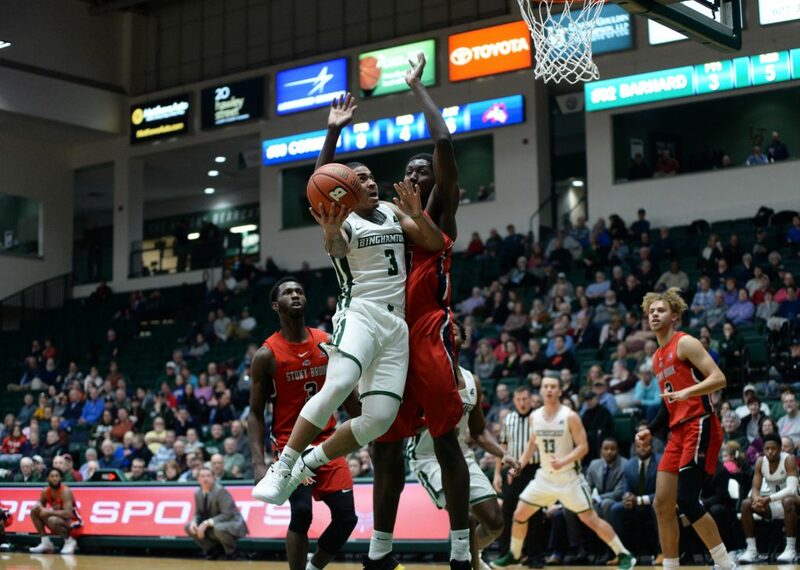 The Binghamton men’s basketball team faltered offensively against the Stony Brook Seawolves in a tough 85-59 defeat. Despite the shortfall, junior forward Caleb Stewart continued his aggressive play, as he recorded his fifth straight game with 10 or more rebounds to tie the school record set by Mahamoud Jabbi in 2010-11. He finished with 16 points and 10 boards, his third consecutive double-double. “In the first half it wasn’t really falling for me, so I had to get out of that rut, but my teammates believed in me that so helped a lot in the second half,” Stewart said. Stony Brook (19-5, 7-2 America East) was lethal from beyond the arc, converting 13 of 25 attempts. Freshman guard Miles Latimer was especially crucial to the Seawolves’ 3-point efficiency, as he finished five-of-seven from three, three of which came consecutively early in the second half. Freshman guard Sam Sessoms finished with 15 points on 6-for-18 shooting, well below his season average of 45 percent shooting from the field. Sessoms and Stewart combined for 31 of Binghamton’s 59 points. Binghamton’s offense was largely patient, settling into their half-court offense more often than not and getting into a system based on dribble hand-offs and pass-and-cut-away motions. Sessoms was dynamic and drew the Seawolves’ attention constantly, despite his poor night from the floor. He was able to consistently penetrate on drives against Stony Brook’s defense and force the defense to slide early, which the freshman guard exploited with five assists. Stewart, Sessoms and senior guard Everson Davis led the Bearcats’ defense, as Stewart recorded four blocks and the two guards combined for seven steals. They also contested shots well at the rim, but the Seawolves were able to secure second chances on 16 of their 36 misses, scoring 22 points on extra opportunities due to the Stony Brook front court that towered over Binghamton (6-18, 2-7 AE). BU operated out of a 2-3 zone, bolstered by a soft press focused on forcing the ball handler into a double team. The Seawolves were able to feed their big men, sophomore forwards Elijah Olaniyi and Jeff Otchere. Olaniyi scored 17 points on an efficient 7-of-13 shooting and Otchere added 11 on a perfect five-for-five shooting performance. “It’s tough because they have that one big dude [Otchere] who they can throw it up to, and that’s just tough to defend,” Stewart said. The Bearcats gave the Seawolves a scare toward the end of the first half, closing the gap to nine points for a short while before Stony Brook pulled away and never looked back. During this stretch, the Bearcats’ front court of Stewart and graduate forward Chancellor Barnard were key defensively as they contested attempts at the rim. Barnard was also effective on the boards, finishing with nine, six of which were on the offensive end. The Seawolves’ offense was based in quick ball movement around the Binghamton 2-3 zone, often working from the wings where they could either get a decent look at a three or feed it into the corner and drive baseline. They had a balanced offense, with five players in double figures and a 19-point game from Latimer. The Bearcats will look to put an end to their three-game skid when they take on New Hampshire on Saturday, Feb. 9. Tipoff is slated for 1 p.m. from Lundholm Gym in Durham, New Hampshire.